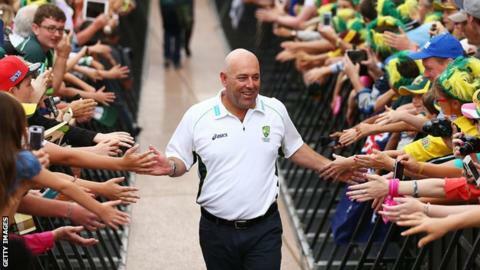 Darren Lehmann's contract as Australia coach has been extended by one year until June 2017. Lehmann, 44, masterminded Australia's 5-0 Ashes whitewash of England and a 2-1 Test series win in South Africa. Australia are top of the one-day rankings and one point behind South Africa in the Test table. "I am proud of what we have achieved so far," said Lehmann. "We are heading in the right direction." Pat Howard, Cricket Australia's general manager, said: "We have been extremely pleased with the results Darren has achieved with the team since he came on board. "He has helped create an excellent team environment that has seen players thrive." Former South Australia, Yorkshire and Australia batsman Lehmann replaced Mickey Arthur on the eve of the 2013 Ashes in England following a 4-0 defeat by India. Although Australia lost 3-0 in England, Lehmann galvanised the side to such an extent that they exacted devastating revenge by winning all five Tests in the return series. In March, they inflicted South Africa's first series defeat in five years. Australia will replace the Proteas at the top of the Test rankings if they claim victory in their two-Test series against Pakistan, starting next week. Lehmann's side face South Africa in Twenty20 and one-day series then India in Tests before co-hosting the World Cup with New Zealand in February and March. "I will be judged by results. If the team is not performing then I am answerable,'' Lehmann said. "Not being afraid to make mistakes, that's the key."